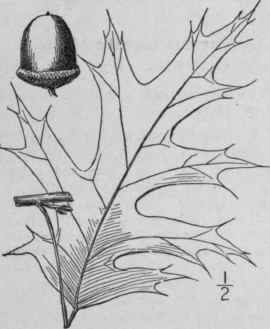 Quercus rubra L. Sp. PI. 996. 1753. A large forest tree, with a maximum height of about 1400, and a trunk diameter of 70, the bark dark gray, slightly roughened. Leaves oval or somewhat obovate in outline, deciduous, when mature glabrous, or pubescent in the axils of the veins beneath, 4'-8' long, 3'-6' wide, dull green above, paler beneath, sinuses rounded, lobes triangular-lanceolate, tapering from a broad base to an acuminate apex, 1-4-toothed or entire, teeth and apices tipped with filiform bristles; petioles 1 1/2-3' long; styles slender, spreading; fruit maturing the second autumn, sessile or nearly so; cup saucer-shaped, its base flat or slightly convex, 8"-12" broad, bracts ovate or ovate-lanceolate, obtuse or the upper acute, appressed; acorn ovoid, about 1' long, 2-4 times as long as the cup. Nova Scotia to Ontario and Minnesota, south to Florida and Kansas. Wood hard, strong, coarse-grained; color light reddish-brown; weight per cubic foot 41 lbs. May-June. Acorns ripe Oct.-Nov. Champion, Black or Spanish oak. Quercus rubra runcinata A. DC. with leaf-lobes nearly entire and acorn 1/2' high, from near St. Louis, is perhaps a hybrid with Q. triloba Michx. 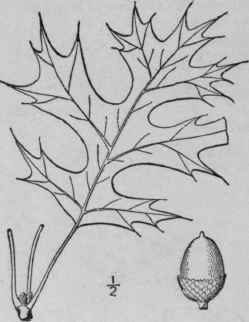 Quercus Catesbaei Michx., a tree of the southeastern states, differs from all related species by having the inner scales of the deep cup of the acorn indexed. It has been observed northward to southern Virginia. Q. palustris DuRoi, Harbk. 2: 268. pl. 5. f. 4. 1772. A forest tree, maximum height about 1200 and trunk diameter 50, the lower branches deflexed; bark brown, rough when old. Leaves broadly oblong or obovate in outline, deeply pinnatifid, sometimes almost to the midrib, bright greem glabrous and shining above, duller, glabrous or with tufts of hairs in the axils of the veins beneath, 3"5' long, the lobes oblong, lanceolate or triangular-lanceolate, divergent, 1-4-toothed or entire, teeth and apices tipped with filiform bristles; styles srender; fruit maturing in the second autumn; cup saucer-shaped, 4"-6" broad, base flat, bracts triangular-ovate, acute or obtuse, appressed; acorn subglobose or ovoid, 4"-7" high, often striate, 2-3 times as long as the cup. In moist ground, Massachusetts to Michigan, Virginia and Arkansas. Wood hard, very strong, coarsegrained: color light brown; weight per cubic foot 43 lbs. May-June. Acorns ripe Sept.-Oct. Swamp Spanish oak. Quercus Schneckii Britton, Manual 333. 1901. A forest tree, attaining a maximum height of about 2000 and a trunk diameter of 8°, usually smaller. Bark reddish-brown, with broad ridges broken into plates; leaves mostly obovate in outline, bright green and shining above, paler and with tufts of wool in the axils beneath, 2'-6' long, truncate or broadly wedge-shaped at the base, deeply pinnatifid into 5-9 oblong or triangular lobes, which are entire or coarsely few toothed, the lobes and teeth bristle-tipped; styles short; fruit maturing in the autumn of the second season; cup deeply saucer-shaped, 6"-8" broad, its scales obtusish or acute, appressed; acorn ovoid, 1/2'-1' long, 2-3 times as high as the cup. North Carolina to Indiana, Iowa, Missouri, Florida and Texas. Wood hard, light red-brown; weight per cubic foot 57 lbs. April-May. 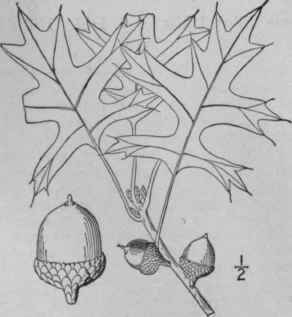 Acorns ripe Sept.-Oct. Has been confused with Quercus texana Buckley.